In June, I wrote a physics-oriented summary of the “Report of the Committee Studying Home Run Rates in Major League Baseball.” The report mentioned the possibility that variations in the location of the center of mass (CM) of the mass of the ball might–emphasis on might–account for some of the increase in home runs the last few years. 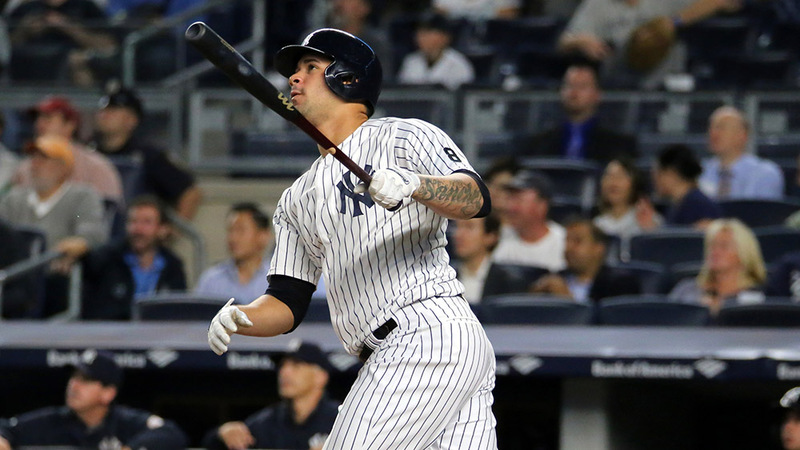 In “The Physics of Bat Flips,” I described the CM as the balance point for a bat–the point at which you can hold a bat up with just one finger without it tipping. Now we are talking about the CM of the ball. I suspect you know exactly where the CM of the ball should be. After all, the ball should be a symmetric sphere, so the CM should be directly in center of the ball. In slightly fancier terms, the CM should be at the geometrical center (GC) of the ball. In an ideal world, the manufacturing process of building the ball from the cork center out to its rubber coating, to the wool windings, and finally, to the hand-stitched cover, would result in the CM aligning perfectly with the GC. But what if in the real world, there isn’t perfect alignment? I suspect this is what the report is referring to when it talks about CM variations. If the CM and GC are perfectly aligned, spinning about an axis out of your screen, over a short distance the ball will travel in a straight line with no wobble as shown below by the middle blue line. The top and the bottom blue lines indicate the edges of the swath of air that must be displaced by the ball as it moves. Let’s examine what happens if the CM and GC of the ball are misaligned by some distance. In the article on bat flips, I pointed out that objects in free flight, like a flipped bat, rotate about their CM. This is also true for a ball in flight. It will rotate about its CM (indicated here by the black dot) not its GC (the red dot). Hence, such a misaligned ball will wobble in flight as shown below. The size of the swath of disturbed air is larger, as shown by the top and bottom blue lines. Since the wobbling ball interacts with more air than the non-wobbling ball, the wobble will affect the flight of the ball. 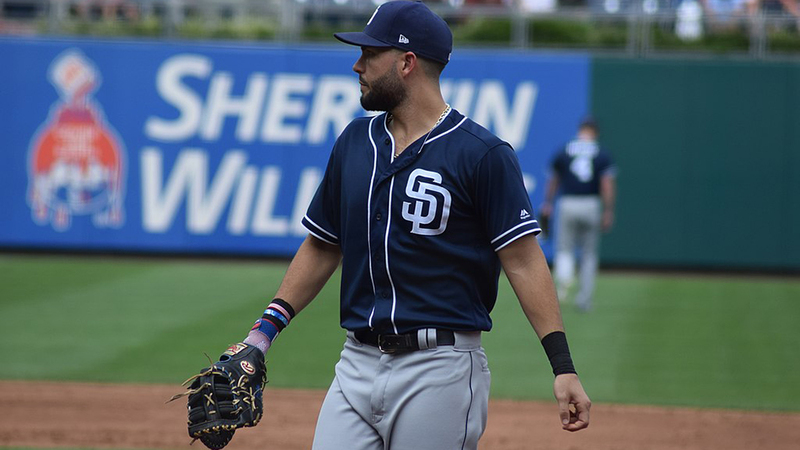 Now we need to remember the drag force on a baseball is proportional to the cross-sectional area of the ball because the ball must cut a swath through the air equal to its cross-section. This is accounted for in trajectory calculations using a ball spinning about its GC–that is, in the no-wobble case. For an example, see Alan Nathan’s Trajectory Calculator. The question is, how to deal with the wobble? I suppose, in principle, I should be able to include this effect in the already messy equations that govern the trajectory of the ball. However, I’m not quite smart enough for that and likely will make a mistake. Besides, explaining the modification to the trajectory equations will put the few readers who have ventured this far into the article to sleep. Instead, I’m going to make the approximation that the wobbling ball acts like a non-wobbling ball but with a larger cross-section. This seems reasonable because the ball is spinning rapidly. So I’ll assume the ball has a larger cross-section than before and use the old trajectory equations for a non-wobbling ball. Now I just need to find the cross-sectional area of the wobbling ball–the size of the swath of air shown above. 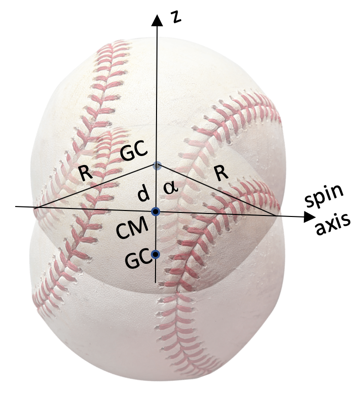 Let’s examine a ball shown below moving into the page with a radius R. The geometrical center, GC, is displaced from the center-of-mass, CM, by a distance, d. We’ll define the z-axis along the line between the CM and GC. The x-axis is perpendicular to the z-axis. The ball can be spinning about any axis in the x-z plane. Notice, if it spins about the z-axis (the axis that points along the direction between GC and CM), it won’t wobble at all. However, if it spins about any other axis, it will wobble. The greatest amount of wobble will occur when the balls spins about the x-axis. So if we want to know the effect of the wobble, we should compare the no-wobble case to the maximum wobble case. Let’s examine the maximum wobble scenario of rotation about the x-axis. At any instant, the ball actually presents the same cross-sectional area to the air as the no-wobble case. However, as the ball spins, the location of this cross-section will change. The ball acts like it is cutting a larger swath through the air. The two extreme locations of the ball as it spins are shown in the sketch below. The approximation will use the cross-section that includes the total area show in the sketch above. This approximation probably works better the higher the spin rate and almost certainly overestimates the effect of the wobble. On the bright side, it is far easier to find the area of the overlapping images of the ball than it is to include the wobble in the trajectory calculation. 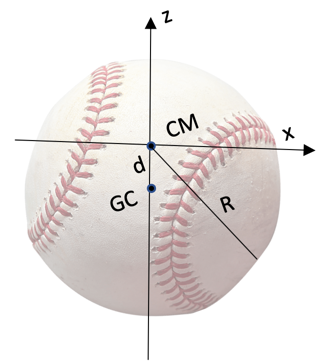 I’ll spare you the geometry of the area calculation except to note that if the GC and CM align, I should get the actual cross-section of the ball. And when the GC and CM are separated by the radius, I should get twice the area of the ball. 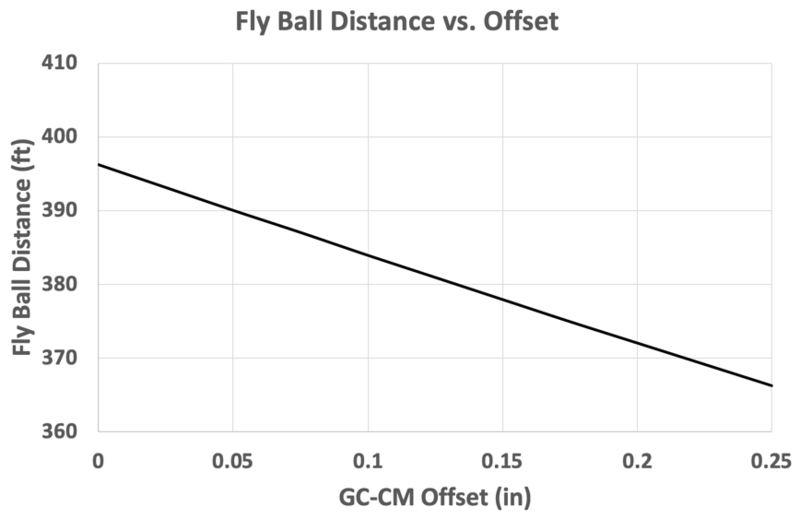 Below is a plot of the distance traveled versus the offset distance between GC and CM for a ball hit at 96 mph with a launch angle of 28˚, a backspin of 1500 rpm and no side spin. As the offset increases, the area increases, which increases the drag force and results in shorter distances. Notice the plot only include offsets from zero to a quarter inch. I suspect any ball with an offset that large would be noticed before it ever got into play. The distance lost is about 30 feet, which is easily enough to explain a change in home run rates. Now, before you get too excited, remember this model is an approximation that certainly overestimates the effect of wobble. It would great if there were experimental results to suggest this theory is reasonable. The bad news is there is no public data available on the GC-CM offset. There was, however, an experiment done by Alan Nathan, Jeff Kensrud, Lloyd Smith, and Eric Lang in Minute Maid Park in 2014. They launched one group of MLB balls at 96 mph with a launch angle of 28˚, a backspin of 1500 rpm and no side spin. What a coincidence! Just the values I used for the graph. They found that while individual baseballs were fairly consistent in the distance they traveled, there was a large variation within any given group of supposedly identical baseballs. They varied in their distance traveled by about 30 feet. Again, don’t get too excited. I got 30 feet with this model by arbitrarily assuming the offset was between zero and a quarter inch. As stated several times previously, this model is an approximation that would tend to overestimate the effect of the “variations in the center-of-mass” described in the committee’s report. Nonetheless, the variations in the distance of well-hit balls generated by this approximation would seem to justify investigating the potential displacement of the CM and the GC in MLB baseballs. If, indeed, manufacturing changes in the ball have reduced the average offset between the CM and GC, it might explain, at least in part, the increase in home runs. Also, lesson one for how to lay out a drilling pattern on a modern bowling ball. Great explanation, David. Baseball needs to take it a 2014 ball, have it 3D imaged, and then mass produced. That alone would take care of a lot of issues. Great piece. Are you interested in taking on the consequences of wobble with the axis of spin isn’t orthogonal to the direction of flight. This makes me wonder about the effect of bat on ball. It suggests that the greater the impact, the greater the resulting displacement. And so harder hit balls would tend to wobble more …unless through sheer chance the impact whacked a poorly made ball back into alignment.